March is a great month to be thinking of food. At Saint Louis Public Library, March is a month to celebrate and explore the joy of food. On 3/6/2014, I attended the Culinary Month 2014 Kick Off with Miss Robbie Montgomery of Sweetie Pies. She was talking with culinary students from the Clyde C. Miller Career Academy and the Beaumont High School. It was great! Offering stories of her life, especially referring to having the “stickability” to pursue your dreams. Miss Robbie recommended to read positive things and said how ideas only happen if you put them into practice. Miss Robbie was very uplifting and encouraging to all the young culinary students attending. I had the pleasure of meeting each class as they came, after her talk, to visit the Science/Technology Room of our Central Library. Here I could talk about our excellent culinary collection, where we have a quarter of our Central Library circulating collection made up of culinary books. I was thrilled to meet Miss Robbie again on 3/8/2014, when she came back and talked to an excited and interested audience in our new auditorium. Again, she was very positive and encouraging members of the audience to pursue their dreams and to believe in yourself. Learning of how Miss Robbie started her restaurant, Sweetie Pies, offered me a view of St. Louis history. Mayor Slay’s representative presented Miss Robbie Montgomery a lovely framed proclamation that 3/8/2014 was to be officially Miss Robbie Montgomery’s Day. 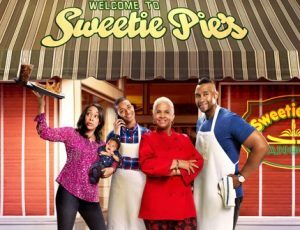 After listening to her second program, I drove up to Sweetie Pies “Upper Crust” restaurant, located on Delmar, and enjoyed a meal of crispy chicken wings, sweet potatoes, okra, and green cabbage. Super-delicious!!! Definitely a place to return too….. Miss Robbie was already back meeting and greeting restaurant guests as they enjoyed their dining visit. What a memory to keep!